Mr. Man-Monster and I live in an apartment which can only be described as “cave-like”. Although there are windows in every room, most of them a) look out into dark alleys and b) are covered so that we can have some privacy. The cats have taken over the two best windows in the house, and will violently kill any houseplants that impinge on their lounging space. So, by definition, any houseplant grown in my house is grown under artificial light. 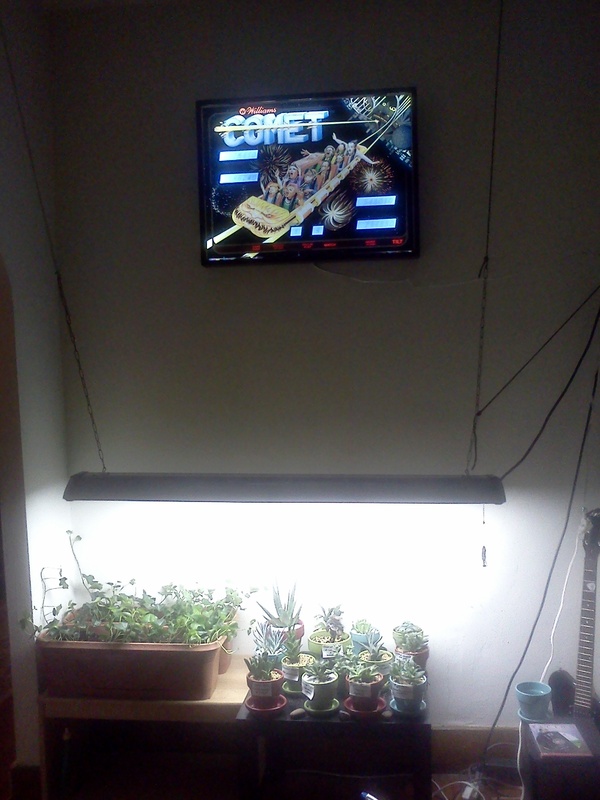 Currently, we have a small “plant corner,” with a single grow lamp illuminating an area of only a couple square feet. Because we have a small and cheap lamp, we need to keep it fairly low over the plants (about 18-24″). It looked really weird in the room, so we hung an illuminated sign from a pinball machine over it to balance the space a bit more. It still looks a bit weird, but it’s way better than it was. Succulents and cacti are notoriously tricky to grow under artificial lighting. This is because most of them evolved in very arid but very sunny areas — their interesting shapes and fleshy leaves are their strategy for survival. So when we move them into our homes, they are in a much darker, damper place than they would generally prefer. 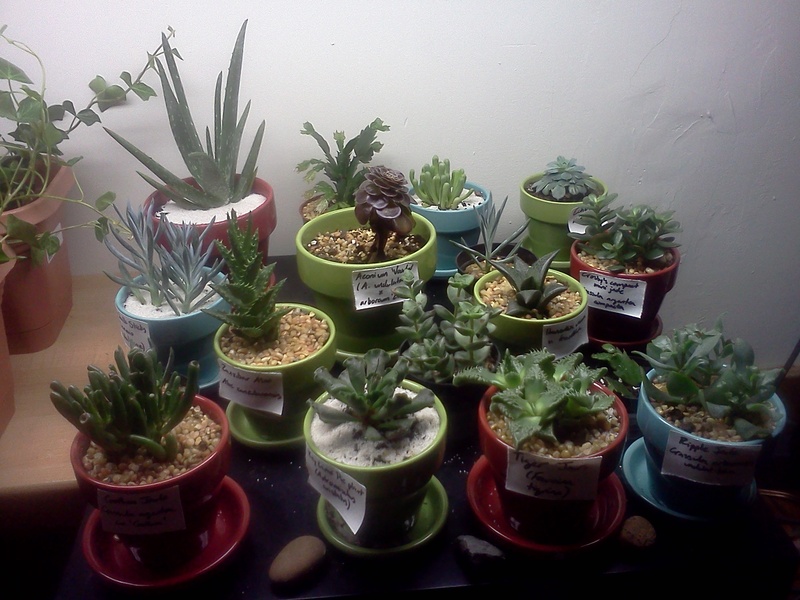 That said, some succulents can adapt very well to living under artificial light. 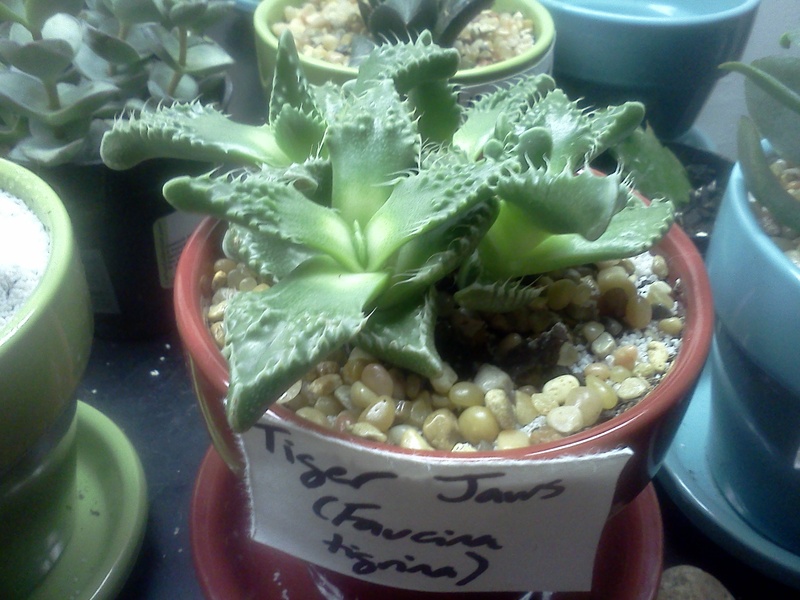 I have had the best luck with various Crassulaceae under artificial light. Crassulaceae are a family of succulents that include jade plants, kalanchoes, sedum, sempervivium, and adromischus (aka ‘crinkle-leaf plant’ or ‘key lime pie plant’). All my Crassulaceae are currently thriving (four different jades and an adromischus; I also gave an unusual kalanchoe to my mother, who is successfully growing it in lower-light conditions as well). There is a huge variety of shape, color, and texture amongst the Crassulaceae — even in a single species (Crassula ovata, the jade plant) there are so many different cultivars it’s hard to believe they’re all the same sort of plant! As an example, here are three of my jades: “Gollum” jade, “Ripple” jade, and a compact jade that looks very much like the wild form of the plant. These are still young plants, each pot has 3-5 seedlings. At the end of the year, I’m going to split them off into individual pots. There were many different plants I didn’t even try to grow under artificial light. For example, most true cacti do not grow well under artificial lighting — the light just isn’t strong enough. Same with plants like split rock and lithops. But I hadn’t heard anything either way about Aeonium plants or Echeveria plants, so I got one of each. Both plants got severely etiolated — because the light is too weak for them, they lost their lovely round shapes and turned into sad, spindly cones. It is very sad because I don’t have any spots where they could thrive, and I don’t have the heart to throw them in the rubbish. But they just look pathetic, don’t they? It’s important to mention, though, that there are a lot of different Aeonium and Echeveria species. It could just be that the specific plants I chose do not do well under artificial light, and that other species or cultivars could be happier in the dark. My Aloe plants haven’t done as well as I thought they would. The big Aloe vera plant has a good color but hasn’t really grown at all, and the little Zanzibar aloe is slightly etiolated in the upper leaves. It isn’t too severe and I actually sort of like the look of the etiolation on that plant, but clearly this is not an optimal way to grow Aloe plants. They’re surviving quite well, but not thriving like the jades. 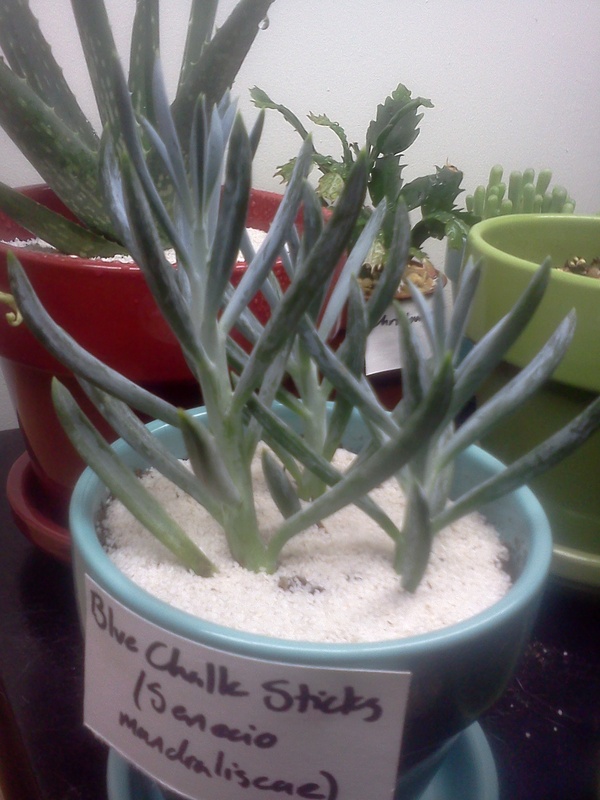 I didn’t think that these blue chalk sticks (Senecio mandraliscae) would do very well under artificial light, because they had a blue color and a powdery bloom on the leaves that I associate with plants that need lots of strong sunlight. But they’ve been very happy. Another plant that has done very well under artificial light is my Haworthia venosa. I couldn’t get a good picture of it without ripping the whole table apart, but I would definitely recommend giving that species a try. Do choose plants with consideration as to their light requirements, not simply because they look cool. Do quarantine newcomers away from the main body of plants for a week or so, to make sure they don’t have pests or diseases that could kill all your other plants. Do put new plants in a fresh pot with fresh soil specifically formulated for succulent plants (it needs to be very quick-draining with not as much organic content as conventional potting soil has). Don’t be afraid to try something you’re not sure will work. Do water the plants the right amount. In my experience, this current group of succulents requires more water than previous succulent plants I’ve grown on sunny windowsills, but they still need to be watered much less than ordinary plants. In general, I mist the plants with a spray mister in the mornings and give them a big drink once or twice a month, depending on how hot it’s been. Do buy a light specifically designed for plant growth. Regular inside lights don’t make all the wavelengths of light that plants need to stay happy and healthy. Do position your light fairly close to the tops of the plants — the amount of light reaching the plants decreases exponentially with distance. 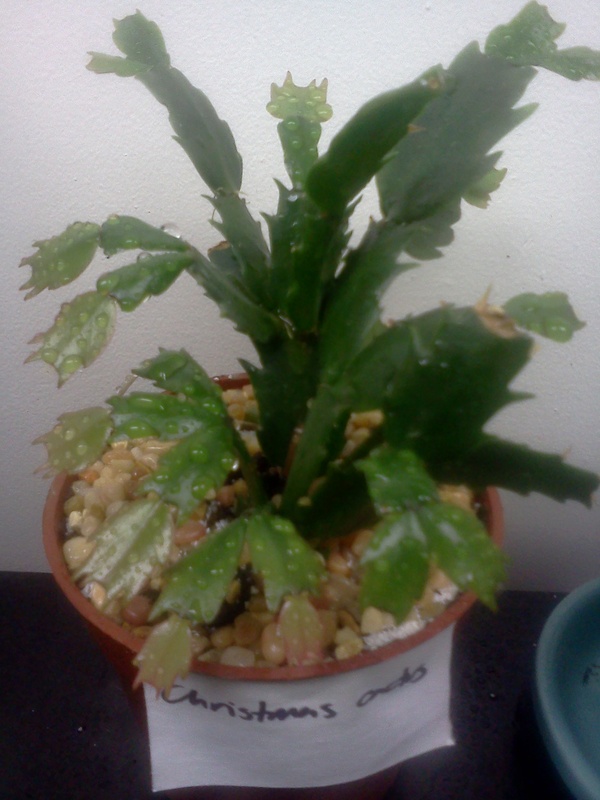 Do consider jade plants and their close relatives, as well as Christmas cactus, as a safe bet. This entry was tagged adromischus, Aeonium, aloe, artificial light, Cacti and Succulents, christmas cactus, Crassulaceae, Echeveria, Faucaria, Haworthia, house plants, jade plant, Lighting, Senecio, Succulent plant, succulents under artificial light, tiger jaw plant. Bookmark the permalink.